Born April 30, 1946 in Portland, America. He is an American draftsman, illustrator and animator. The same artist attributes to the rainy hometown the merit of having pushed him as a child to devote himself assiduously to the design. At the age of 14, he sent some drawings to Disney that were rejected for his young age. Along with the refusal, however, there is also an encouragement to continue to exploit an already undeniable talent. Graduated, he moved to New York where he gained a reputation as an illustrator for magazines such as New York Times, Rolling Stone, Vogue and many others. From 1983, the year in which he works on his first animated film, he learns art, and will never stop. 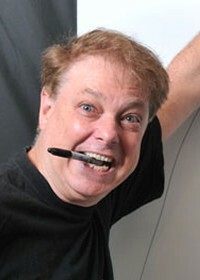 His works will help to reinforce the idea that the passion for the 'cartoons' is not exclusive to children and the unique style of its courts immediately attracts the attention of fans as well as that of many companies, such as MTV, for which it produces numerous acronyms and advertising. With the earnings of these commissioned works and the awards received for his shorts, Plympton realizes his personal childhood dream and funds the first of his six feature-length films The Tune, completely self-produced. Today he continues on his way, fiercely independent and always surprisingly original.